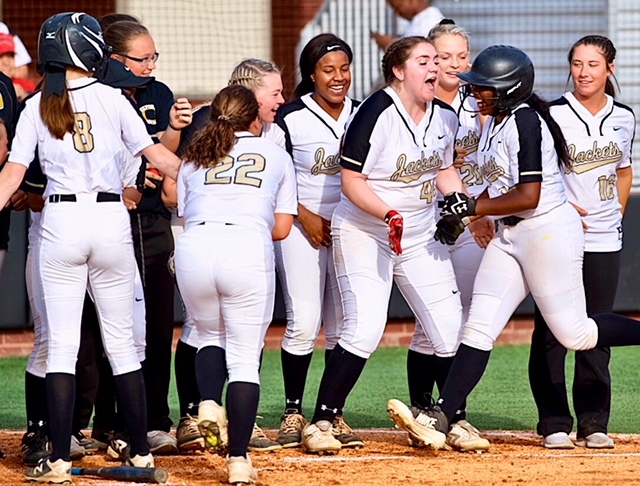 OXFORD – Brentli Champion and Ashleigh Reaves each drove in four runs and Oxford hammered five home runs as a team as the Lady Jackets scored 13 unanswered runs to beat Southside 13-3. Champion homered twice, while Sarah Howell, Ametria Wilson and Reaves each hit one. Howell, Crestavia Curry and pitcher Emmali Meads all had three hits. Eight of Oxford’s 16 hits went for extra bases. Southside scored three in the top of the first then Oxford went to work. Wilson hit a two-run homer in the second to tie the game and Curry doubled later in the inning to put the Lady Jackets ahead for good. Champion hit a two-run homer in the fifth and a three-run walk-off shot in a seven-run sixth. Reaves hit a three-run homer and Howell a two-run shot in the big inning. Alexandria 1, Douglas 0: Emmah Rolfe pitched a one-hitter with nine strikeouts and Leighton Sparks scored the game’s only run on an error as the top-rated Lady Cubs (23-3) clinched their regular-season area title. The only hit Rolfe allowed was a two-out single in the seventh inning and she faced just two batters over the minimum. Pleasant Valley 3, Piedmont 2: Cortney Williams hit a two-run homer in the second and Mikayla Kendrick hit a go-ahead solo homer in the fourth after Piedmont tied the game with two runs in the top of the inning. Julianna Ballew had two hits for the Lady Raiders (20-8). Ashville 12, Ohatchee 4: Ashley Doss and Gracee Haynes each had three hits for Ohatchee, but Ashville answered every time the Lady Indians scored and pulled away with a six-run sixth. Jazmine Adams and Autumn Widgeon had two hits apiece for Ohatchee, which tied the game 1-1 in the third and held a 3-2 lead after batting in the fourth.